The re-building, grading and compaction of the bases and addition of new coarse angular sand footing in the arenas is tentatively scheduled to be completed in one week starting Friday October 30 and hopefully complete by Friday November 6, 2015. The initial phase will be in the indoor and jumping (east) arenas. Heavy equipment will be operating and we ask that everyone give them as much leeway as possible. 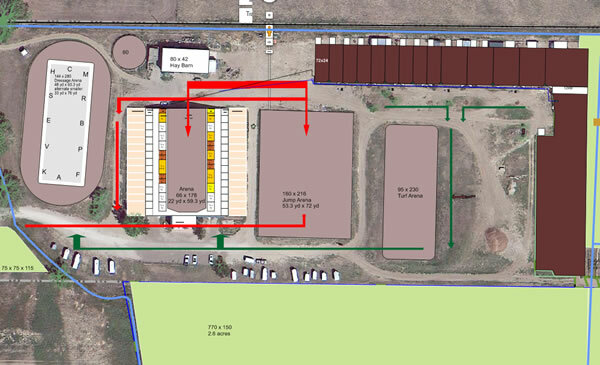 Initially most of the work will be on the north end of the barn and north end of the jumping arena (see image below). We recommend that paddock and pasture horses be walked south across the turf arena and taken into the barn through the south doors. If everything goes as planned the bulk of the material will be delivered by semi trucks on Monday through Wednesday. The dressage (west) arena will be available for mixed use (at least initially) while the work proceeds on the other two arenas. Trucks and equipment mainly operating along the red lines. Please follow the green lines with horses unless another route obviously makes more sense at the time. Construction is never entirely predictable so we'll update via e-mail if there are any changes. We apologize for the inconvenience but hope you find the resulting improvements to be well worth it! Please contact Stephanie (970) 391-1626, or Sue (970) 219-6398 or in person with any questions or concerns. You can also always e-mail us paradisefoundboarding@gmail.com.